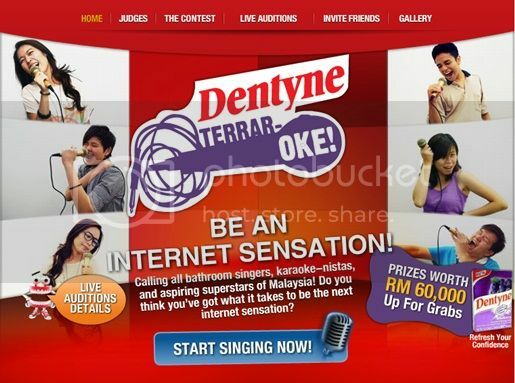 Recently, the very good people of Nuffnang have been promoting on this particular online singing competition, organised by Dentyne who are looking to find out who would be the next internet sensation from Malaysia. As many you guys would know, I have been doing my fare share of music covers with the rest of TeamTehTarik members in the past so this would be an interesting competition for me to join! So, in the past we have been working on several covers with the acoustic guitar, the ukulele as well as the piano however the requirement of this competition is slightly different. Instead, they would want auditions to be done in A Capella style with no musical instruments what so ever. Reason why this becomes a challenge is that there are so many great singers out there, it is really hard for me to really stand out. So after much deliberation and help for the rest of TeamTehTarik, we concocted a plan. Using the old school musical styles of the "Doo-Wop" era, I decided to cover an oldie that many are familiar with. After hours and hours of singing and editing, this is what we got. Hope you guys enjoy the song! So for now I guess what I need is just people to spread the word and if you like the video, just leave a comment or two! :D Lets hope things go well with this competition! A very unique way of sending in your entry. I hope you win it. By the way, I think I read the sign you put up in the beginning of the video as "Tank" instead of "Tarik"
terrerrrrrr dood! haha good luck! Exchange link : Patrick here from the SW-Box blog (blog.sw-box.com). Just wondering if you would like to exchange blogroll links with me. If yes, please leave me a comment on one of my recent blog posts. Then I'll link to you first. When you have a free moment, just link back ok? If you're not interested, that's cool too. In which case, happy blogging and have a great day. good luck broo...creative....hope u will win this contest..really creativeee n enjoy to watch..
Planking : Fad or Danger? Tell Me What to Sing and Win!